From the creators of Surgeon Simulator comes its prequel - an adventure with a hero like no other! 'I am Bread' is the epic story of a slice of bread's journey to become toast. Take the intrepid, crumby adventurer on a journey from his natural confines of the kitchen, through the home of an unsuspecting owner and into the outside world. This bread will be boldly going where no other bread has gone before . 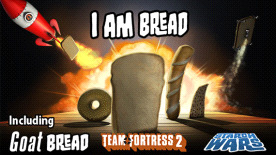 . .
As you become attuned to bread's uniquely challenging control system, you'll progress from a fumbling slice of bread to a masterful bread ninja. Traversing your environment is intentionally demanding but reliable, making it possible to master even the most majestic and acrobatic of manoeuvres. Controller Recommended! GoatBread - Goat Simulator-inspired level called 'RAMpage mode'. You won't believe your eyes. Starch Wars - Attack of the Scones! Take out the Empire's Rye Fighters in this level inspired by a certain beloved universe!